This article originally appeared in the November 2017 issue of CCO. “I heartily endorse this event or product,” says a monotone Krusty the Clown in a snippet of video used to advertise everything from cough syrup to atomic particle accelerators. Krusty’s cut-and-paste approach to celebrity endorsement might be a long-running gag on The Simpsons, but the rise of influencer marketing in social media may mean the joke is getting just a little too close to reality. Leaving aside the carelessness with which Disick carries out his sponsored activities – I mean, he had one job to do – don’t let it escape your notice that the brand also scripted the post for him. 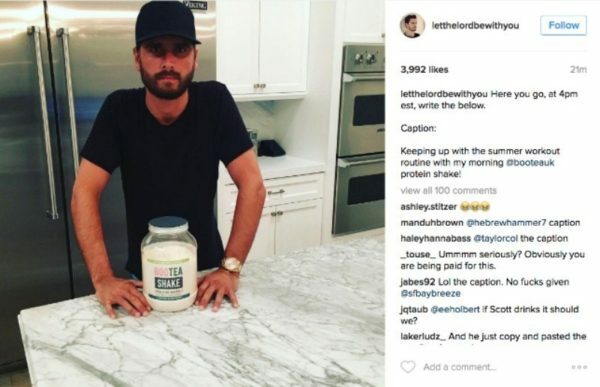 I like to imagine those 12 unremarkable words were the result of a lengthy copywriting process of agency drafts and stakeholder approvals where no one – even Disick himself – noticed that he’s supposedly preparing his morning protein shake at 4 in the afternoon. And, while Disick may have unwittingly disclosed the brand relationship, the intended text contains no such disclosure. The whole exercise is about as authentic and convincing as the president’s hair. It’s not surprising that influencer marketing is a popular way for marketers to get their message out. When it comes to trusted sources of information, a word-of-mouth recommendation always ranks highly. We’re also more likely to trust those we admire; the famous, the noteworthy, or the highly successful people who represent qualities and values we might aspire to. It’s why every new book comes with recommendations on the jacket from authors we’ve read; why sports fans dress like sports players and rock fans dress like rock stars. These influencers don’t always have to be mega-stars either, but the right influencer with a big enough audience within the right niche can have a massive impact. Huzzah! If consumers are skeptical toward brands talking about themselves, let’s fire up the social media machine and find ways to get more trusted and relatable individuals talking about us instead! Let’s take the reasons they don’t trust our own marketing – too scripted and rehearsed, too self-serving and out of touch, too fake – and carry them over into the word-of-mouth space until we sap these trusted individuals of any credibility as well! OK, I’m sure that last bit isn’t what marketers intend when designing their influencer strategies, but that will be the result if they continue the way they’re going. The rise in social influencer marketing has consumers casting a wary eye on celebrity posts that happen to contain a brand name. 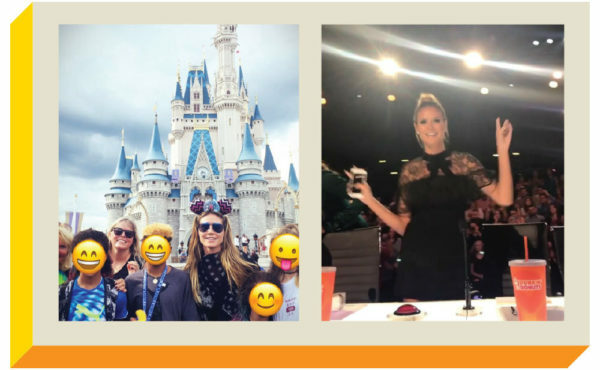 Is the Disneyland vacation photo Heidi Klum posted on Instagram a paid promotion? (We don’t think so.) But when Dunkin’ Donuts is a sponsor of America’s Got Talent, the photos of Klum with Dunkin’ Donuts-brand drinks are intentional (no #ad label in sight). When is a social media post an ad? Some social media influencers, particularly on Instagram, command highly active audiences numbering in the millions. No wonder some brands are prepared to fork out tens or even hundreds of thousands of dollars for a single product friendly social media endorsement. And some are eager to make these paid endorsements appear as naturally occurring word-of-mouth recommendations … anything but a far less trusted advertisement. Having had a few conversations over the years with marketers who use similar tactics, their defense is usually that the audience isn’t stupid – that it’s easy to detect paid influencer campaigns – so it’s all cool, really, and stop trying to overthink it. When George Clooney visits another stunningly luxurious location and makes a big scene about opting for the pod coffee, we know it’s a paid fiction because we’re in the ad break waiting for the return of our regularly scheduled program. We don’t even need to believe Clooney drinks pod coffee at home for the associations of luxury and charm to infuse our perceptions of the brand. It’s a statement, not necessarily a literal truth. It’s certainly not word of mouth. So far, so marketing 101. 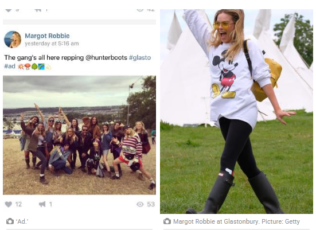 However, when Margot Robbie posted photos to Instagram of herself in stylish Wellingtons at the Glastonbury Festival (hashtag brand name), her posts lacked the context of a commercial break. While Robbie originally included the hashtag #ad in the post, some eagle-eyed fans spotted that it was deleted soon after and replaced with #glasto. Understandably, her followers were confused; was the original hashtag a mistake or was this really a paid post trying not to be? Was it an ad or wasn’t it? People really wanted to know as this would change how they viewed the content: word of mouth or paid promotion? And the fact that a clear disclosure matters to them proves they do consider one more valuable and trustworthy than the other, which is exactly why some marketers would rather smudge over the whole disclosure thing. Of course the audience cares about disclosure. If I began namedropping various social media and content marketing tools into my columns and tweets, you’d want to know if I genuinely used the products or if I was just paid to pretend I did. Right? Sorta crucial information when assessing the validity of a recommendation. Yet, a recent study found that a staggering 93% of sponsored content posted by A-list influencers on Instagram did not adequately disclose the paid brand relationship. Can marketing influencers get in legal trouble? In the United States, the Federal Trade Commission has begun cracking down on inadequately disclosed influencer marketing on social media – particularly Instagram. Earlier this year, the FTC sent warning letters to more than 90 influencers and marketers. There really is no excuse for ignorance either. Did anyone really think there wouldn’t be rules about this stuff? The FTC series of endorsement guides includes an extremely helpful section on social media. Naturally, if you live outside of the United States you should check if there are any local guidelines or restrictions. But if you follow the FTC guide, you’re unlikely to go too far wrong. It’s up to you whether you tag posts with #sponsored or #promotion or something equally unambiguous; however, in most cases, three characters are probably all you need: #ad. But don’t think you can hide the disclosure in a forest of other hashtags and still be compliant. The same goes when the disclosure is hidden behind a link or “more” button, as can happen on Instagram or Facebook. Everyone who sees the post – even a truncated version – should see the disclosure, not just those who click. This is where some content marketers could come unstuck. Your native advertising or sponsored article might carry a clear disclosure but if the related social media doesn’t you could still be in breach. Anyway, the FTC also has a detailed guide to native advertising that spells out a number of scenarios and how disclosures should be handled. Sadly, I suspect some of those marketers who most need to understand and abide by these rules are the ones most likely to ignore them. Clearly disclosing influencer posts as paid sponsorships or ads sort of undermines why they’re doing this in the first place. But instead of tapping into the greater trust created by word of mouth, their approach is actually eroding trust in social media even further. Jonathan Crossfield is the chief consulting editor of Chief Content Officer magazine. He describes himself as a storyteller because writer, editor, content strategist, digital marketer, journalist, copywriter, consultant, trainer, speaker and blogger wouldn’t fit neatly on a business card. Jonathan has won awards for his magazine articles and blog posts on digital marketing, but that was so long ago now it seems boastful to keep mentioning it in bios. He lives in the Blue Mountains near Sydney, Australia with a very patient wife and one very impatient cat. Follow Jonathan on Twitter @Kimota.